There are a couple reasons why I haven't blogged in so long. First, I was and still am embarrassed about missing deadlines yet again. I kept thinking that any day now I would catch up and release the book(s) that I announced, and it just didn't happen. So much going on in my personal life that robs me of the time and energy and mental capacity to write. Which leads me to my second point: depression. I can't blog or do anything remotely social when I'm depressed. I'm sure I've talked about it before, but I've been dealing with general and social anxiety for most of my life. Everyday I fight to overcome it, to deal with what life throws at me, to be productive in some manner, but there usually comes a time when I lose that fight. And then, in turn, I'm faced with depression, which robs me of everything. It's not just about not finding joy in things or not having a passion for writing; it robs me of feeling anything. When I'm sad or angry, I'm still capable of writing, as it's usually pretty therapeutic. I don't mind the "negative" emotions, as it can still ignite a passion to write--sometimes even moreso than when I'm feeling ok. When depression hits, I'm basically just a hollow shell. I don't feel anything, I don't care about anything, everything seems pointless. I'm totally numb. This usually stems from my anxiety getting so high, that my mind just shuts down, probably as a form of self-preservation. My only saving grace through it all, is that I know it will pass. But I've been noticing a trend lately where it's not passing as quickly as it once did. It could be part of getting older, it could be that there's more stuff that overwhelms me on a daily basis, I'm not sure. Once it does pass, I start feeling anxious and worried about how long it took to pass, and so the vicious cycle begins. I know this is probably way too much information, and to some, it might sound like I'm making an excuse. To which, all I can say is, I won't be announcing anymore release dates. I think I may have made this claim before, but this time I have to mean it and stick with it. Because not only isn't it fair to you, the readers, who are awaiting the release of my next book(s), it's not fair to me to put added pressure and anxiety on myself. I love writing and I love sharing my stories, and I never want to get to the point where I resent it. Books are a great escape for authors and readers alike, and I never want that escape pod to feel like a prison cell. I appreciate your patience and understanding. More books are coming, I promise you. I just can't promise a certain date. As always, take care of yourself. If you too are suffering from depression, remember that even in the darkest of times, there is always the glimmering light of hope. There is no shame in seeking help. Life is precious...your life is precious. "The Vampire's Castle" Is Out Now! I'm happy to announce that my first full-length horror novel is out now! 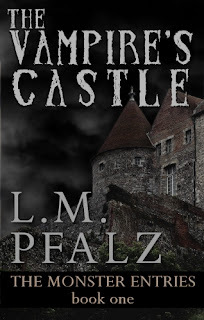 "The Vampire's Castle" is the first book in "The Monster Entries" trilogy. Diana Barrows thought she was taking a typical family vacation with her husband and three children. But when a heavy storm hits and strands them at a sinister castle, things quickly go from bad to worse. Diana soon discovers the inhabitants of the castle are monsters—vampires, a werewolf, a witch, goblins, and other creatures—who are keeping her family prisoner there. Diana must find a way to escape with her family, before they become permanent residents of The Vampire’s Castle. Available to buy at Amazon or borrow via Kindle Unlimited. Wow, another year gone! It's crazy to me how fast time goes. I hope everyone had a great holiday season. I know I haven't updated since October, but these last couple of months flew by with just so much going on in my personal life. But I don't want to talk about that. I want to talk about the future, because that is what I'm really trying to focus on. I've wasted enough time beating myself up for not being productive enough over the last year, even though a lot of stuff was beyond my control, namely health issues. I'm not 100% but I'm hoping to get back to work very very soon. With a little luck, I'm really hoping to be able to release a lot more books in 2016 and play catch-up a bit. I know The Vampire's Castle was due out months ago, and it, along with several other projects, had to be shelved while I focused on getting better. That book, as well its sequels, are my top priority right now, and my current goal is to get them released over the next few months. For now, I'm not going to talk about other books I'd like to release this year. I need to take it one day at a time and not overwhelm myself too much. Suffice it to say, I have no shortage of stories I want to tell and even ones that I've already penned that are on my looong to-do list to publish. I have a lot of work ahead of me and I am eager to get started. But I've also learned a valuable lesson in making sure to take care of myself first. And that was a tough lesson to learn because I tend to be very hard on myself. I tend to push myself past my limits, and I realize now that's a foolish thing to do. We live in a very fast-paced world, and I often get very overwhelmed with the idea that time is running out or that I'm falling behind. And that leads to a lot of negative thinking that only ends up derailing me all the more. So, I'm trying to slow down in all aspects of my life. In fact, that is my resolution for 2016. Basically, I want to have time to stop and think clearly, time to stop and smell the roses. There are so many authors now who publish very frequently, and it creates a very competitive atmosphere in this business. But I remember when I was young, I wrote a lot, but I still took the time to really live with each of my stories. They weren't products to be churned out. They were escape pods to all sorts of different worlds, a vacation from the harshness of real life. I didn't write a lot to meet a deadline or because I was "falling behind" compared to this author or that author. I wrote a lot because they were stories I wanted to escape to and worlds I wanted to frequently visit. I don't want writing or publishing to be a source of stress and anxiety. I was letting a lot of self-doubt creep in, which can be quite crippling in any creative endeavor. So part of my resolution in 2016 is to write freely again and have fun with it. It's easy to get burdened by small details and the pursuit of perfection when creating something, but really I just want to tell stories. That's all I've ever wanted. So, I'm going to try to do just that and not get weighed down by fear or doubt. When I started this blog post, I didn't plan to get into all of this, but I've kept a lot of it bottled up for awhile and it feels good to get it off my chest. 2015 was a lousy year for me, and oddly enough, I've heard the same from so many people. I hope that your 2015 wasn't so bad, but if it was, let's try to make 2016 much, much better. As important as I believe it is to be kind to one another, I think it's as important to remember to be kind to yourself. With each passing year, I think it's easy to reflect back and think about all the things you didn't do, didn't accomplish, and don't have. We, as human beings, just need to be gentler with ourselves. We need to forgive ourselves for what might be considered failures and move on and learn from our mistakes. Dwelling on the things that can't be changed is only wasting precious time now on things you can change. And this is something that I, myself, am going to try really hard to do. So, with all that said, Happy New Year, everyone! Here's to a (hopefully) phenomenal 2016!